For decades the Kusunda language was thought to be on the verge of extinction, with little hope of ever knowing it well. The little material that could be gleaned from the memories of former speakers suggested that the language was an isolate, but without much evidence either way it was often classified along with its neighbors as Tibeto-Burman. However, in 2004 three Kusundas, Gyani Maya Sen, Prem Bahadur Shahi and Kamala Singh, were brought to Kathmandu for help with citizenship papers. There, members of Tribhuvan University discovered that one of them, a native of Sakhi VDC in southern Rolpa District, was a fluent speaker of the language. Several of her relatives were also discovered to be fluent. There are now known to be at least seven or eight fluent speakers of the language, the youngest in her thirties. However, the language is moribund, with no children learning it, as all Kusunda speakers have married outside their ethnicity. It was presumed that with the death of Rajamama Kusunda on 19 April 2018 the language went extinct though Gyani Maiya Sen could be the only surviving speaker. Watters (2005) published a mid-sized grammatical description of the language, plus vocabulary, which shows that Kusunda is indeed a language isolate, not just genealogically but also lexically, grammatically, and phonologically distinct from its neighbors. It appears that Kusunda is a remnant of the languages spoken in northern India before the influx of Tibeto-Burman- and Indo-Iranian-speaking peoples, however it is not classified as a Munda or a Dravidian language. It thus joins Burushaski, Nihali and (potentially) the substrate of the Vedda language in the list of South Asian languages which do not fall into the main categories of Indo-European, Dravidian, Sino-Tibetan and Austroasiatic. Phonetically, Kusunda has six vowels in two harmonic groups, which are arguably three vowels phonemically: a word will normally have vowels from the upper (pink) or lower (green) set, but not both simultaneously. There are very few words that consistently have upper or lower vowels; most words may be pronounced either way, though those with uvular consonants require the lower set (as in many languages). There are a few words with no uvular consonants that still bar such dual pronunciations, though these generally only feature the distinction in careful enunciation. Kusunda consonants seem to only contrast the active articulator, not where that articulator makes contact. For example, apical consonants may be dental, alveolar, retroflex, or palatal: /t/ is dental [t̪] before /i/, alveolar [t͇] before /e, ə, u/, retroflex [ʈ] before /o, a/, and palatal [c] when there is a following uvular, as in [coq] ~ [t͇ok] ('we'). In addition, many consonants vary between stops and fricatives; for instance, /p/ seems to surface as [b] between vowels, while /b/ surfaces as [β] in the same environment. Aspiration appears to be recent to the language. Kusunda also lacks the retroflex consonant phonemes common to the region, and is unique in the region in having uvular consonants. [ʕ] does not occur initially, and [ŋ] only occurs at the end of a syllable, unlike in neighboring languages. [ɴʕ] only occurs between vowels; it may be |ŋ+ʕ|. Kusunda has several cases, marked on nouns and pronouns three of which are nominative (Kusunda, unlike its neighbors, has no ergativity), genitive, and accusative persons. Other case suffixes include -ma "together with", -lage "for", -əna "from", -ga, -gə "at, in". There are also demonstrative pronouns na and ta. Although it is not clear what the difference between them is, it may be animacy. Other verbs may have a prefix ts- in the first person, or zero in the third. Before the recent discovery of active Kusunda speakers, there were several attempts to link the language to an established language family. B. K. Rana (2002) maintains that Kusunda is a Tibeto-Burman language as traditionally classified. Others have linked it to Munda (see Watters 2005); Yeniseian (Gurov 1989); Burushaski and Caucasian (Reinhard and Toba 1970; this would be a variant of Gurov's proposal if Sino-Caucasian is accepted); the Nihali isolate in central India (Fleming 1996, Whitehouse 1997); and again with Nihali, as part of the Indo-Pacific hypothesis (Whitehouse et al. 2004). ^ Hammarström, Harald; Forkel, Robert; Haspelmath, Martin, eds. (2017). "Kusunda". Glottolog 3.0. Jena, Germany: Max Planck Institute for the Science of Human History. ^ a b Watters, David E. 2005. Kusunda: a typological isolate in South Asia. In Yogendra Yadava, Govinda Bhattarai, Ram Raj Lohani, Balaram Prasain and Krishna Parajuli (eds. ), Contemporary issues in Nepalese linguistics p. 375-396. Kathmandu: Linguistic Society of Nepal. ^ "Rajamama, lone Kusunda language speaker, dies". Retrieved 2018-06-18. ^ Paul Whitehouse; Timothy Usher; Merritt Ruhlen; William S.-Y. Wang (2004-04-13). "Kusunda: An Indo-Pacific language in Nepal". Proceedings of the National Academy of Sciences of the United States of America. 101 (15): 5692–5695. doi:10.1073/pnas.0400233101. PMC 397480. PMID 15056764. Reinhard, Johan and Sueyoshi Toba. (1970): A preliminary linguistic analysis and vocabulary of the Kusunda language. Summer Institute of Linguistics and Tribhuvan University, Kathmandu. Toba, Sueyoshi. 2000. Kusunda wordlists viewed diachronically. Journal of Nationalities of Nepal 3(5): 87-91. Toba, Sueyoshi. 2000. The Kusunda language revisited after 30 years. Journal of Nationalities of Nepal 3(5): 92-94. Watters, David E. 2006. "Notes on Kusunda Grammar: A Language Isolate of Nepal". Himalayan Linguistics Archive 3. (2006) 1-182. Donohue, Mark, & Bhoj Raj Gautam. 2013. "Evidence and Stance in Kusunda". 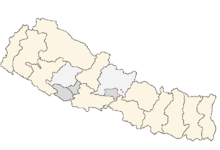 Nepalese Linguistics 28: 38-47. Portal to Asian Internet Resources (Project). Bibliography for Seldom Studied and Endangered South Asian Languages. Germany: John Peterson. Rana, B.K. A Short note on Kusunda language. Janajati 2/4, 2001. "Obscure language isolate will die with this woman". The Hot Word - Hot & Trending Words Daily Blog at Dictionary.com. 2012-06-03. Retrieved 2012-08-02.